Barry Ocason regularly travels all over the world to write about the more remote and lesser known festivals such as the Spider Festival in Rio Tabo, Brazil. He only found out about this when a travel magazine arrived unexpectedly through the door advertising it. So bags were packed for him and his teenage daughter Kristen and they made their way from Juneau, Alaska to a place they would never forget. Any parent would be horrified to discover that their daughter was being followed but for Ocason it was unbearable, he had already lost one daughter, Kristen’s twin, when she was murdered and now the man that haunted his own dreams was being described by his daughter as her stalker and he was here. This book played mind games with me, it is a very dark and disturbing. You know that feeling when you feel like someone is watching you and you turn around and no one is there but you feel if you had been a second sooner you would have seen someone. That is how reading this book is. 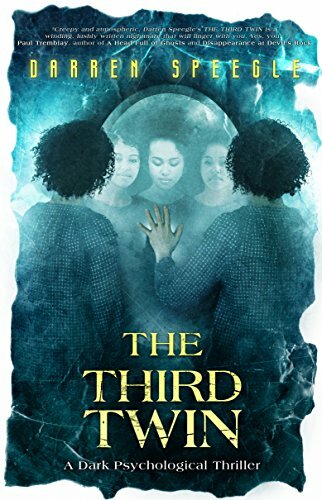 Through history there has been a fascination with twins well this story takes a step further to create a third twin, a much darker and disturbing bridge into the unknown. And the scary thing is The Ocasons are not on their own. Why not click below for a little taster of this book. Bet you want more. So what makes this thriller novel so special? Darren Speegle: I suspect it is unlike anything you’ve ever read. It deals with family issues at first, then segues into darker territory, the harrowing suspense of knowing you are being targeted, as a family, by a man in an elephant mask who is looking for something that you don’t understand the meaning, much less allure of. Until the last, that is, when the final revelations prove to be about more than this world, more than the next. The Third Twin is a ladder-like journey into other, transcendent spheres. Tell us more about this novel’s lead character. Darren Speegle: Barry Ocason is supremely confident in his life, deals with situations on his terms. Has command of what goes on around him. Has raised a fine daughter. Retains a reasonably healthy relationship with his ex-wife, though the reason for their divorce was so sudden, so horrible and meaningless, it might have resulted in far worse. He has a grip. Has a handle on existence. Tries to. Until. Until reality breaks down and everything he thought he understood about life melts in front of him. Then the warrior and survivor he is kicks in and will stop at nothing to find out why what’s happening is happening. Why should readers give psychological thriller a try? Darren Speegle: Because it is different, unique. If you want to take a journey you have never taken before, this is the one. I wrote the thing in a war zone, Iraq, during heavy activity. My mind went where it wanted to. The Third Twin is the product of that experience. It’s a dark fantasy suspense thriller trip you’ll never forget. Nice to see Crystal Lake publishing getting some blog exposure. Joe, the guy behind it, is a lovely guy with a hard work ethic. Great review as well. May just have to slap this onto the top half of my TBR pile.